Sometimes it's hard to be a woman holding all your guns with just two hands. 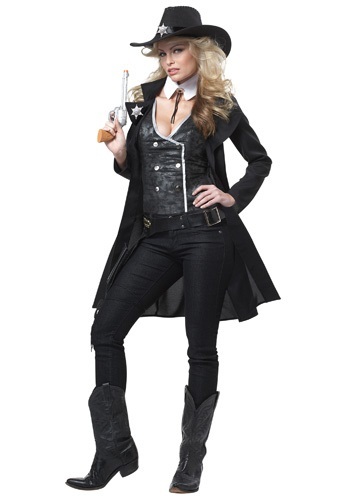 That's why this detailed Round Em Up Cowgirl Costume comes with a faux-leather holster belt to help keep your six-shooters straight. Because if you think it's hard hanging onto the reins with a pistol in each fist, just wait until it comes time to play a little poker! Ace high or royal flush, it's not gonna mean much if you can't pick your cards up off the table, let alone make your play. And who cares if you know when to hold em and know when to fold em if you reach for a glass of whiskey and wind up taking a different kind of shot! Risking something like that is downright reckless. Plus, the alternative is a great-looking costume set like this, which includes everything you need to look like a real enforcer except a pair of boots and a Peacemaker. And it seems like you might already have one or two of those handy! We're not going to beat around the bush: you'll have bad times if you think a union suit and a prayer is all it takes to corral the rough-and-tumble lowlifes who gave the Old West its wild reputation. That's just a matter of fact. But in a great-looking law-lady getup like this, with a bevy of fun and functional accessories at your disposal, we don't think you'll have trouble bringing anybody to justice!